The Lisette Portfolio Dress – was there ever a more coveted pattern? It came on my radar not long after I decided to fashion my own handmade wardrobe and there it has remained firmly lodged. I’ve spent many a late night ebay trawl trying to track down a copy of this out of print rarity. An updated version has been released by Liesl + Co but for me, it lacks the clean lines of the original and don’t even get me started on my aversion to v necks. On a recent whim, I asked if anyone had a copy of the pattern on Instagram and was overwhelmed with the response. Numerous people offered to keep an eye out, @sewjillian and @sarah_randt kindly proffered to trace off their own patterns but were saved from their labours by @annmariemakes and the generous gift of her own uncut pattern – despite me pointing out she could sell it online for a song. This kindness of virtual strangers stopped me in my tracks – why do something for absolutely no personal gain to help someone you’ve never met? And whilst I think I know the answer, such offers are rare finds and ones I’ll not forget. The pattern travelled to me from America and its journey inspired me so much, I couldn’t stop waxing lyrical about it. During a conversation with a friend, she suggested that once finished with, I should pass it on. And in an instant a plan was hatched – this pattern was destined to go adventuring, passed from maker to maker fuelled by the currency of kindness. But before I send it on its way, a few notes about its construction. The pattern is a Size R5 14, 16, 18, 20, 22 Eur 40-48 FR 42-50. I traced off a size 14 and then racked my brains on the adjustments necessary to fit it to my frame. According to the pattern envelope I was two sizes down at the bust, one up at the waist and 2 up at the hips. And I hadn’t a clue how to bridge the gaps. And then I remembered @beyond_measure_uk commenting how experimental she used to be before she honed her craft and I figured I’d just have a go and see where it get me. To mitigate potential misery, I made a second trace to play with – in the face of abject failure I’d still have the basic shape in my possession. And then I set about a toile or two, making adjustments using the disparity between nested patterns on the original, as a guide. From the front and back pieces I took 1.5 cm off the shoulders, shaved off up to 1 cm at the neck, 1.5 cm off the sides down to the waist and graded out to 2 cm at the hip. Basically I just played around with it until I got a result that no longer resembled a sack. I also added 8 cm to the bottom as I was hankering after house dress length rather than shift. Pass it on – offer up the pattern on your blog/IG with deets on how to get involved in #patternrelay. You decide who the pattern goes to next. The pattern is to remain uncut and passed on within a month of receipt. Tag me in your posts @wrong_doll and use the hashtag #patternrelay and we can chart its journey together. So who’s up for the challenge? I’d love to see this girl travel. If you’d like to join in, message me here or over on Instagram next week and share with me your passion for the portfolio. I’ll pick its next port of call on Sunday 4 September. Bonne chance et bonne voyages Lisette! What a great idea! Such a lovely dress too. Good luck with the #patternrelay! Thank you – I’m so glad you like the idea and my dress – I’m quite proud as it was my first attempt at major pattern adjustments and I think I pulled it off 🙂 Thank you for stopping by – it’s really appreciated. fantastic – its really lovely. I love the style lines – very elegant casual (pockets such a bonus), and that neckline is a lovely shape. I have looked up other makes and it looks like an incredibly versatile dress. Multi sized patterns are so handy as they are much easier to grade (once you get the hang of it, it becomes second nature……. although I am also prone to a bit of overconfidence there as I have just finished an asymmetric dress and had to do some internal fixes with scraps of fabric after! )and your fabric choice is as ever – perfect! looking forward to seeing where lisette goes next! 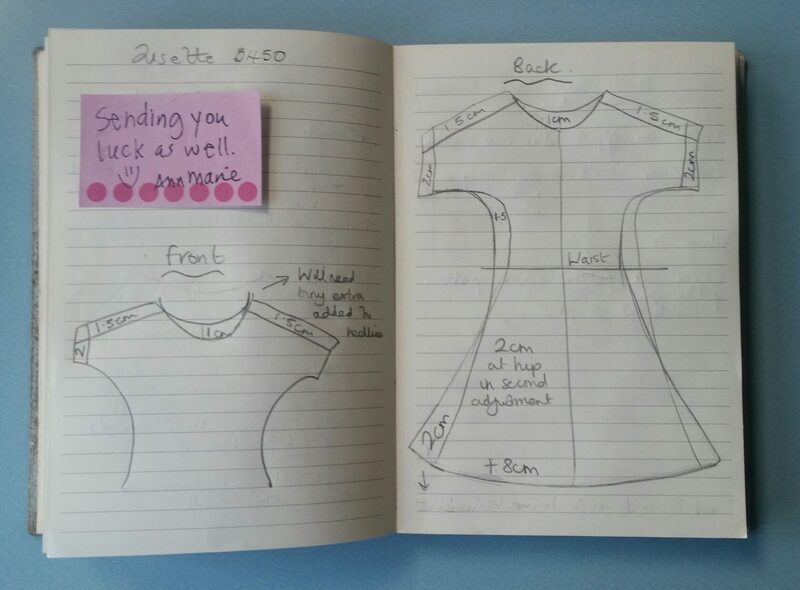 Thank you Eimear – I’m so glad you like the dress 🙂 It was a step up for me as I’m not quite at the second nature stage of grading! How I wish I could pop round and pick your brains when I’m drowning in projects like this! It was actually not that bad – I just lack confidence and am easily thrown off balance. I’m really chuffed with it – particularly the fabric choices which I do love together. Last time I put two different patterned fabrics together it was quite Frankensteinian and I can see how I’ve progressed since then. There’s been quite a bit of interest in the pattern so I do hope she gets to travel far and wide. You are right to be overconfident – you are my refashioning guru! I used be a lot more confident and when I made my debs dress years ago I made the pattern myself (it was not well sewn btw) but I was spot on with the pattern. in ways the more I have learned since has me second guessing myself so sometimes is the best to jump in – I wish I knew more sew-ers where I live, but at least I now know some knitters and crochet-ers to meet up with now and its lovely to meet / talk to other makers whether here or online. I saw a ‘winter’ version of that dress in denim with a sweater underneath………looked brilliant as well – think its one of those amaing versatile patterns…. looking forward to your chain reaction!! You are right Eimear – it is great to be able to link up with people here and online – what did we do without the internets! There are lots of interpretations of the pattern out there so it will be really interesting to see what people do with it. I hope it gets to go on a bit of an adventure – it would be nice to see where it’s been a year or so down the line – if the tissue paper survives and the sewers keep up the momentum. Still thinking about your denim dress – it is da bomb! Your creation of the portfolio dress is really lovely and suits you well; you have a real knack for fabric vision. Like you, I went on a bit of a crusade for this pattern for a while because it’s such a perfectly sweet and versatile dress, practical and flattering, but the ones that came up on my searches were going for $50 or more, gulp, therefore, I would love the chance at sewing the dress up on this relay. Thanks for the fantastic passing it forward idea. Great dress. Love the colour combinations. The pattern relay is a great idea, but i worry that I wouldn’t be able to alter it to my size.